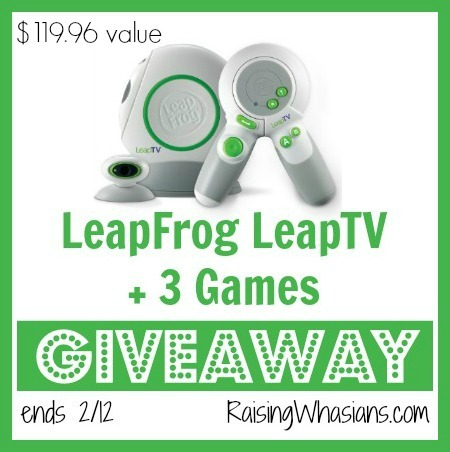 Keep Kids Active this New Year with LeapFrog LeapTV! Post sponsored by LeapFrog as a LeapFrog Mom Squad Ambassador. All FUN opinions are my own. May contain affiliate links. I love when the New Year rolls around. It’s the opportunity to be a better parent to my kids, in all areas of life. One of my goals for this year is to ensure that my kids are active EVERY DAY. The goal seems easy, but there are definitely days when weather, moods and schedules can prevent the healthy lifestyle I want for my family. And while technology has it’s good points, it also can lead a dangerous path of “couch potato” behavior. That’s why I’m super excited to share how much we LOVE the LeapFrog LeapTV. It’s the healthy balance of the gaming your kids love and the “active” learning they need to grow. 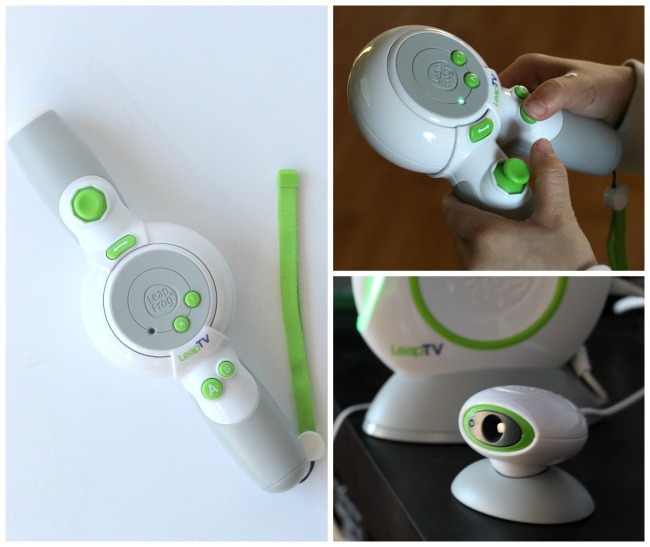 If you’ve been around for awhile, you already have seen my LeapFrog LeapTV review. 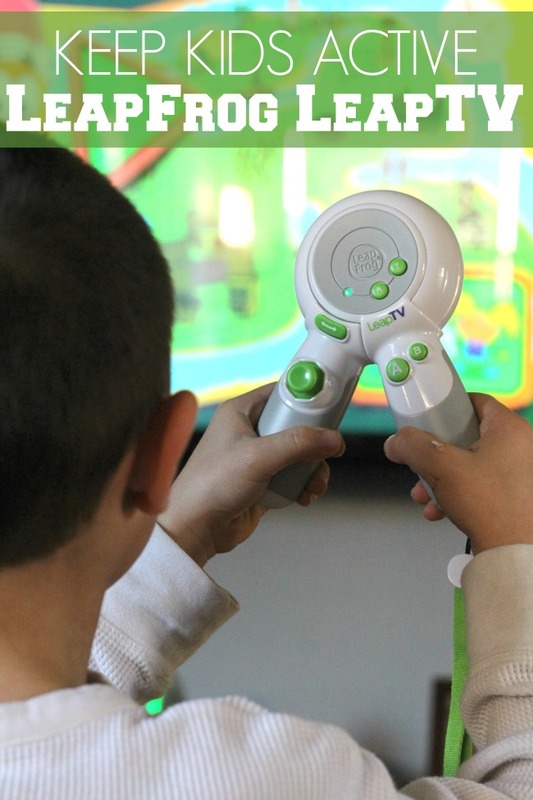 But in case you missed the fun, here’s a few more amazing reasons why my family loves LeapFrog LeapTV Educational Gaming System plus how to keep kids active this year! Be sure to scroll down for an amazing giveaway too! Classic Control – Grab the LeapFrog LeapTV controller and use like a classic video game controller! There are lots of buttons, including mini toggle joystick. Pointer Play – This controller does more than just classic play! With a press of a button this controller transforms into a pointer too, for more fun play! Body Motion – But my favorite part of the LeapFrog LeapTV controls doesn’t require a controller at all. That’s right, your KIDS become the controller as they use their hands, their feet, even their heads to play time! Activity, play and learning? A seriously amazing mom dream come true. And that’s not the only activity these kids are getting. Their minds are getting a workout too! Geared from ages 3 years to 8 years, it’s one of the few systems that my kids can play together! From alphabet recognition to complex math, critical thinking, creative drawing and more, the LeapFrog LeapTV Educational Gaming System does an awesome job of keeping my little learners engaged at all times. Plus with their favorite characters (such as Disney Frozen, Nickelodeon Blaze, Princess Sofia and more), they are learning along with their pals too! I mean how can my toddler resist learning the alphabet when Princess Sofia does too? With lots of different activities for different learners in each game, there’s definitely something for everyone! With 100+ available LeapFrog approved games and videos available, my kids will never be bored! My kids aren’t the only ones getting a workout! My husband and I love learning along with our kids too! You’ll find us hinting at clues to get our learners thinking, and even using our arms and legs to pop bubbles too. With mom and dad being active, it only continues to encourage our kids to stay active too. Win-win for the whole family! Plus LeapTV provides a great opportunity for our family and even our extended family to connect, make memories and laugh together! The LeapFrog LeapTV provides so many opportunities for kids to stay active in the new year. From active moving to active learning, we love having LeapFrog as a part of our healthy family activities! LeapFrog LeapTV is available now for an even lower MSRP of $59.99 at many retailers, which includes console, motion capture camera and controller. Be sure to look for LeapFrog LeapTV and of course all of the other amazing LeapFrog learning products at your kids’ favorite stores. Be sure to follow LeapFrog via Facebook, Twitter, Instagram and Pinterest for the latest in educational products, tips and more! This disclosure is made in accordance with the FTC 10 CFR, Part 255 Guides Concerning the Use of Endorsements. Entrants must only enter with either one email address, IP address, and/or Facebook account. Anyone found violating these rules will be disqualified. It is at the sole discretion of the admin of the giveaway if the winner has met the rules or not. Each household is only eligible to win LEGO FRIENDS: Girlz 4 Life Blu-ray via blog reviews and giveaways. Only one entrant per mailing address per giveaway. Winner is subject to eligibility verification. Be sure to follow Raising Whasians via Facebook, Twitter, Google, Instagram, Pinterest and YouTube for more of your favorite family recipes, kid crafts, and giveaways! The body motion feature will really help them get lots of physical workouts! My son is starting to be very interested in computers and computer games, and I like the idea of a way to introduce them without inducing the still sitting that generally goes with them. I love that LeapTv combines gaming, learning and physical activity! my nieces and nephews would all find this to be irresistible! Three little grandkids all under age 6 will love this, and they live in Ohio where the winters are cold. Fingers crossed. My granddaughter loves the iPad, but is getting too much couch time. Active learning like this would be right up her alley! by making them learn and get therm on their feet to have their fun. My son would play it on cold winter days. I think just the movement would be more than they are doing now. This allows for a multitude of physical movement and exercise movements. This would be beneficial to their bodies not only for exercise but for encouraging thinking skills and pushing off boredom. It would get them moving and involved, rather than being sedentary in front of a TV. LeapFrog Leap TV would get my nephew up and moving around instead of sitting around playing on his tablet. It will help them learn while being active so they wont even know they’re learning. This would be a great way for the kids to stay active during the summer months! it will help my niece stay active and entertained. She can learn and play at the same time. With this cold weather here to stay for awhile this would be great way to get the kids moving and be excited to do it. This will help give my daughter something to do when it is too cold to go outside. Oh my goodness! My grand daughter loves leapfrog products! I love leapfrog products because they help me teach her so many things. I love the fun physical exercise this one will provide. Anytime you can make learning fun for children, it is a win win for everyone. It will be helping get the wiggles out of my granddaughter. I think this sounds like a wonderful tool to help little ones learn and have fun at the same time. 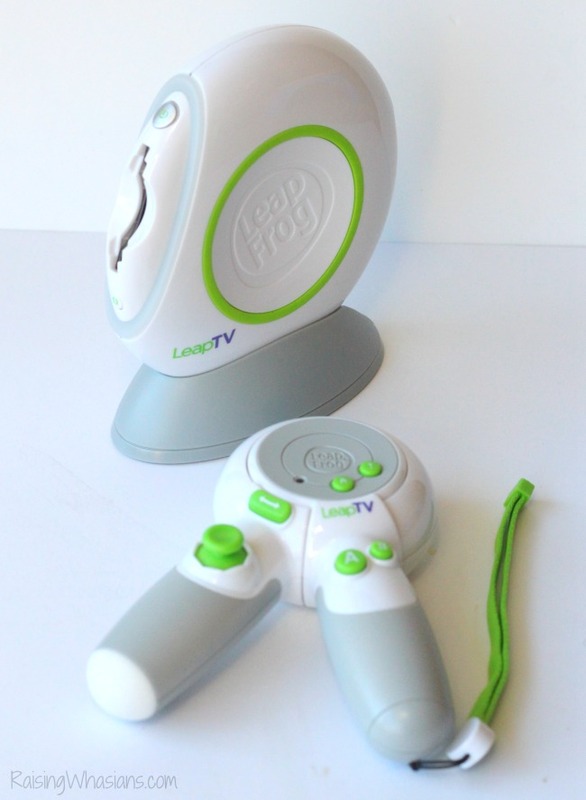 LeapFrog Leap TV would help my kids stay active indoors when it is too cold or rainy to go outside. 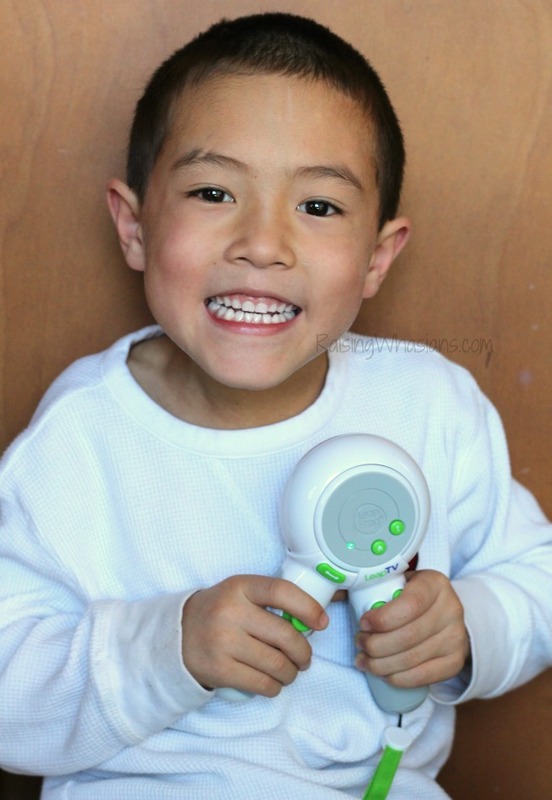 Active learning and active moving from Leap Frog Leap TV would be great for my grandson! Leapfrog would help my younger grandkids get off of their tablets and glued to their shows & get them moving around with active learning! My granddaughter likes to be doing something all the time. I love leap frog learning toys. This is the main way my son learns. 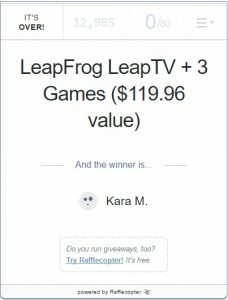 It would help them keep active on days they arent able to go outside keeping 3 kids busy is hard, this is the first time i have seen the leapfrog leap tv. This would keep my nieces moving while they are having fun. It would help my son get that excess energy out while learning and having fun. With all of the snow that we have, this would be perfect for my son to stay active while being indoors. With this winter being so crazy – they’ve had to stay inside a lot more. This would at least get them up and moving! It will keep my grandkids active when they come and visit me and it’s to hot in the florida heat for them to go out and play!! Will be a great way for them to stay active inside. It will get them off the couch and moving. It will help my kids get up and off the tablet! And hopefully entertain them just as much! My grandson would love this. He loves his Leap Pad and has started playing all kinds of games online and on my phone. He hasn’t played on a tv yet and this would be a great way to keep him active! It can encourage them to learn through fun and play. 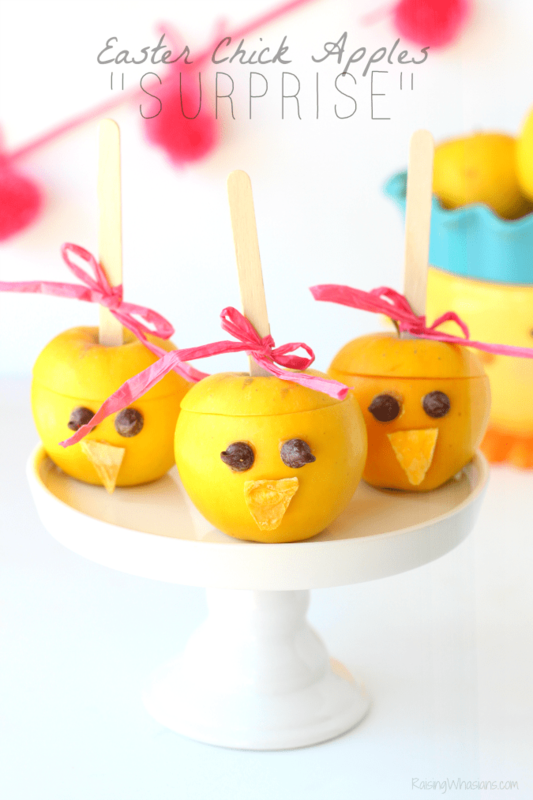 This is a great way for them to play and be active even while stuck indoors! It will keep them active because it will be fun. This set can keep kids moving while they play indoors during very cold or wet weather. It’ll keep my kids mind active and learning thru this wintery cold. The joy of playing a video game without the laziness!! this will keep them playing and having fun while dancing around! It will help my grandchildren minds and bodies stay very active and I like that. This looks like a fun way to stay active, especially on rainy days. Leap Frog Leap TV would help keep our kids active, especially this winter when it’s cold & wet outside! This will help them to stay active indoors! It keeps them active and when they can’t go outside. My toddler daughter is a bundle of energy all day long. I just can’t keep up! I do my very best and take her out a ton where she can burn off some of it, but it would be awesome to have this for when she’s really a live wire or there is bad weather. 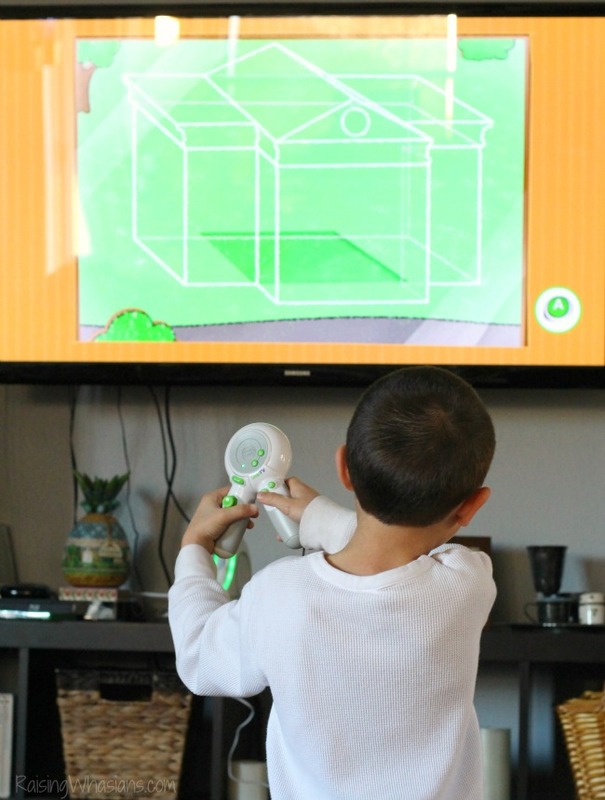 LeapTV’s interactive feature will keep the kids active, especially on rainy days when they’re stuck indoors. My boys are really starting to get into technology but I love the fact that leapfrog tv would keep my kids active even though they are using technology. My kids love technology and games! This would be great to keep them active on super cold or wet days! Living in New England we are cooped up most of the winter. it would be a great way for them to stay active indoors while learning! I love that my grandson can have fun while learning at the same time. I also love that my grandson can stay active no matter what the weather. My 2 year old son always wants to play wii with my daughter but he is too little and she wont let him. It would help him learn and give him something to do to think he is playing a game like his big sister. It can keep them active by interacting with the games on Leap Frog. The LeapFrog LeapTV can keep my grandkids busy learning new things, playing fun games and getting exercise indoors while the winter weather keeps them from playing outdoors. This will keep them active in the cold months when they dont go outside much and on road trips etc. This would definitely help my daughter being engaged and active in the cold winter months. This would keep them off the couch on those days that are too hot, too cold or just too icky to go outside. Ive got a playstation 4 that I love. a Leaptv would be a neat way to let my kids play video games “like mommy” but they’d actually be learning and staying active! so neat! Baby #2 is due next week so this would be perfect for our 4 year old! It could keep her busy and active, especially those first few weeks when we aren’t able to leave the house very much! This would help keep them active during the winter and spring when they are forced inside because of the weather. It will help them be active while indoors. My son gets lazy in the winter months this would help keep him active . I think this would be great for snow days…like today! They would be able to use this to keep active during the winter months for example today would have been great to have this we are all snowed in the house. It is a huge temptation to use the television to keep your kids occupied when you need to complete a task. The great thing about the Leap Frog Leap TV is that it is interactive. This means that your kids are not just passively viewing television but instead that they are engaged and thinking as they view the content. It would keep them busy especially on snow days like today. This would definitely help keep my kids active and learning at the same time which is awesome! My youngest is 5 & he loves games and puzzles are his favorite! I think this would be perfect for them! Being active and having fun. this would be perfect for winter days that its not as easy to get outside to play ! Not really certain they need more activity since they are VERY active already, but it would probably add a little structure to it. My nephew is already active as it it, but this will be great for him. My neice and nephew would love this because they love interacting with the TV like Dora and diego shows so they would get a kick out of this and they can learn along with being active. It will help keep them moving . It would get the kids up and moving along with the games and learning at the same time. It’s a win-win! This would be great for winter days or when it is real rainy outside,and they can’t go out and play ! This would get my Grandson up and moving around while he plays the games, this is perfect for the winter months when it is too cold to go outside and play. This would keep my nieces active by keeping them moving and learning.I know they would have so much fun with this. Your kids stay active because their body serves as a controller as well. Their movement allows them to learn and stay active at the same time. This would keep my little one active because he would be using his small motor skills and having fun at the same time.